This may come as no surprise to some readers, but I thought it appropriate to note anyway. 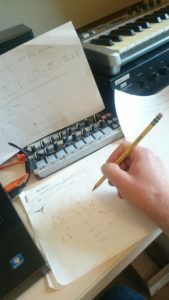 During the blog writing about the rhythmic analysis – part 1, I noticed I would tighten up the definition of terms, and also the actual implementation of the algorithm significantly. I would start writing something, seeing what I had just written and thinking “this just does not make sense” or “this implementation must be off, or just plainly wrong”. Then, to be able to write sensibly about the ideas, I went back and tidied up my own mess. In the process, making a much more reliable method for analysing the features I wanted to extract. What was surprising was not that this happened but the degree to which it happened. In the context of artistic research and the reflection embedded in that process, similar events may occur. *In metric /rhythmic genres, one could easier analyze and extract musical features related to bar boundaries and rhythmic groupings. * Interaction itself could also create meter, as the response time (both human and technical), has a rhythm and periodicity that can evolve musically due to the continuous feedback processes built into the way we interact with such a system and each other in the context of such a system..
* Static and deterministic versus random mappings. Several people was interested in more complex and more dynamic controller mappings, expressing interest and curiosity towards playing within a situation where the mapping could quickly and randomly change. References were made to Maja S.K. Ratkje and that her kind of approach would probably make her interested in situations that were more intensely dynamic. Her ability to respond to the challenges of a quickly changing musical environment (e.g. changes in the mapping) also correlating with an interest to explore this kind of complex situations. Knowing Maja from our collaborations, I think they may be right, take note to discuss this with her and try to make some challenging mapping situations for her to try out. * it was discussed whether the crossadaptive methods could be applied to the “dirty electronics” ensemble/course situation, and there was an expressed interest in exploring this. Perhaps it will be crossadaptivity in other ways than what we use directly on our project, as the analysis and feature extraction methods does not necessarily transfer easily to the DIY (DIT – do it together, DIWO – Do it with others) domain. The “Do it with others” approach resonates well with what we generally approach btw. * The complexity is high even with two performers. How many performers do we envision this to be used with? How large an ensemble? As we have noticed ourselves also, following the actions of two performers somehow creates a multi-voice polyphonic musical flow (2 sources, each source’s influence on the other source and the resulting timbral change resulting thereof, and the response of the other player to these changes). How many layers of polyphony can we effectively hear and distinguish when experiencing the music? (as performers or as audience). References were made to the laminal improvisation techniques of AMM. * Questions of overall form. How will interactions under a crossadaptive system change the usual formal approach of a large overarching rise and decay form commonly found in “free” improvisation, At first I took the comment to suggest that we also could apply more traditional MIR techniques of analyzing longer segments of sound to extract “direction of energy” and/or other features evolving over longer time spans. This could indeed be interesting, but also poses problems of how the parametric response to long-terms changes should act (i.e. we could accidentally turn up a parameter way too high, and then it would stay high for a long time before the analysis window would enable us to bring it back down). Now, in some ways this would also resemble using extremely long attack and decay times for the low pass filter we already have in place in the MIDIator, creating very slow responses, needing continued excitation over a prolonged period before the modulator value will respond. 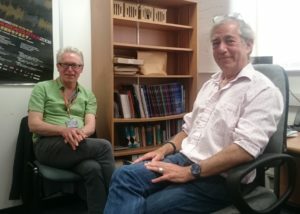 After the session, I discussed this more with Simon, and he indicated that the large form aspects were probably just as much meant with regards to the perception of the musical form, rather than the filtering and windowing in the analysis process. There are interesting issues of drama and rhetoric posed by bringing these issues in, whether one tackles them on the perception level or the analysis and mapping stage. * Comments were made that performing successfully on this system would require immense effort in terms of practicing and getting to know the responses and the reactions of the system in such an intimate manner that one could use it effectively for musical expression. We agree of course.